Ines Swaney demonstrates improvisation techniques. Allow me to introduce myself. You may have seen my name occasionally in this publication or in connection with NCTA Continuing Education, but, on May 8th at the behest of Ines Swaney, in her “Improvisation Techniques for Language Professionals” workshop, I proudly renamed myself No-Nonsense Norma. As participants we had to introduce ourselves by matching our names with adjectives that began with the same letter as our names and that revealed something about each of us. Thus, we met Sunny Sarah, Romantic Rebecca, and Exuberant Emilia. This novel introduction method was the first of many activities that gave us a chance to stretch our memory muscles, work out our solution-finding skills, play with words, and use our imaginations. 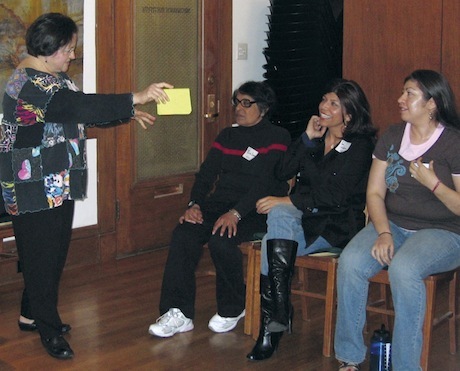 Ines’s unique workshop drew the attention of beginning and experienced interpreters and curious translators, and was possible thanks to the support of the California Federation of Interpreters. Solution-finding: In how many ways can you go from point A to point B? We had to rack our brains to devise a dozen different ways of getting from one corner of the room to the other (walking, skipping, on the knees), each way different from the one used by the people ahead of us. Rapid thinking: In a covert-Freudian game of word association and quick thinking, we threw “word-balls” at each other. Thinking differently: Since we all attended primary school, we of course can recite the months of the year in chronological order, but have you tried to put them alphabetical order? Not so easy, we discovered. Working with a partner: Those of us who are used to working in solitude found the dual-speaker exercises challenging. The goal of the exercise is to alternate words with a partner in order to answer a question in complete sentences with proper grammar. Interpreters, as well as spouses, may be used to completing other people’s sentences, but when you have to do this one word at a time in an unfamiliar context, predicting the other’s thoughts and completing them in a grammatically-correct way can be mentally demanding. Speaking in public: For those who shy from speaking in public, the workshop was an opportunity to practice improvised, playful speeches about specific events, topics, and an enormous array of toys and gizmos that Ines managed to carry in a single bag. Displaying imagination and artistic skills: Once we had all warmed up, had gotten rid of much of our shyness, and were feeling camaraderie, the more artistic types had a chance to recite a poem of their own in Gibberish, which an “interpreter” rendered in unexpectedly poetic English. Nina posted this article under Continuing Ed., Interpretation	on Wednesday, September 1st, 2010 at 12:06 pm	You can follow any responses to this entry through the RSS 2.0 feed. Both comments and pings are currently closed.